Canadian Canoe Routes • View topic - 60L canoe barrel only? Post subject: 60L canoe barrel only? Although I've been a member for quite a while, I still haven't been out on a multiday canoe trip! I'm really trying to give myself a push here and trying to get the gear together (I will be renting canoes for the summer to find what I like.. if I even like canoeing). What I'm looking at right now is to get one pack, for 3-4 day excursions at the most. I was really interested at just getting one 60L Barrel and harness, probably from recreational barrel works. I have been reading around on the forums and the disadvantage with barrels are that they seem to be a little less comfortable, harder to pack since they are a firm material and do not bend around the gear. 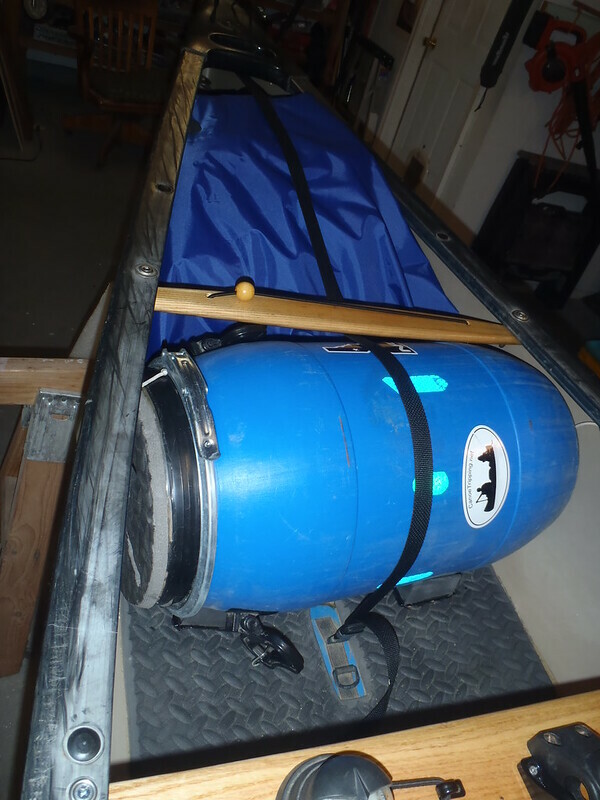 The biggest concern I've read was that with a 60L barrel it doesn't fit between the gunwales while portaging? The reason I was aiming towards a barrel was for its waterproofness and floatation ability's. 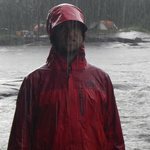 I was on the MEC website and was looking for canoe pack in general, but could only find backpacking bags? I'm welcomed to any recommendations, and since I'm just starting out, I don't want to get anything too expensive. If you have any questions about me that can help provide a good answer that would be great! Post subject: Re: 60L canoe barrel only? IMHO, unless you are running white water, barrels aren't a necessity, and even then, a canoe pack with an Ostrom liner, or a Sealine pack will keep your stuff floaty and dry. Having said that, even on our flat water trips, we keep our food in a blue barrel ... and our gear in canoe packs. ... I'm not quite sure I follow what you're saying here. If you're starting out - and have some confidence that you'll keep tripping for years - invest in a good portage pack. If in a few years you've gone full whitewater with multiple barrels, you'll still have use for a good portage pack on flatwater trips. I really like my Cook Custom Sewing (Hybrid) Guide. I even crammed two 30l barrels in my Guide for an interested forum member; there was room left for a tent. They also have some smaller options. 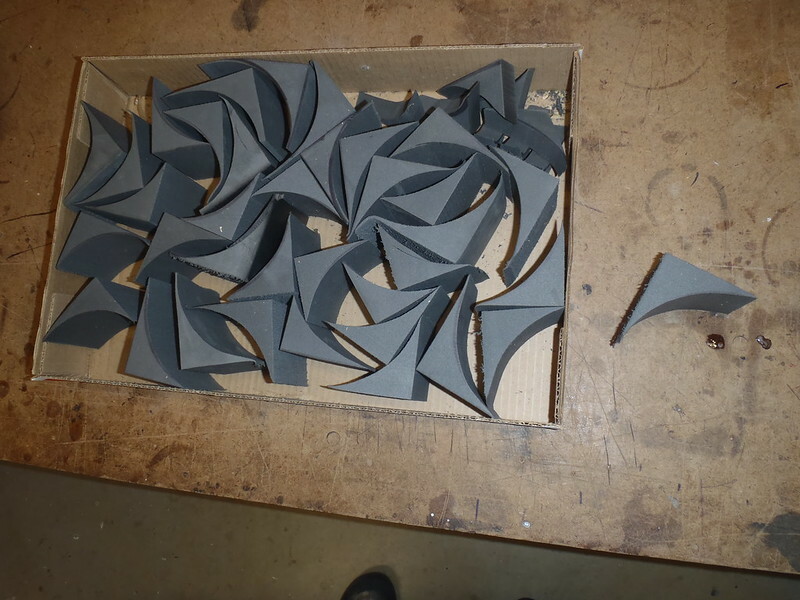 Maybe you could hit up forum member Chris Randall to make you something. He doesn't have a pack listed for sale but there's a photo of one on his site. I have his barrel organisers (Brit spelling for Chris), paddle pockets and custom PFD pack. Very high quality stuff and he's in Manitoba so Canadian shipping won't hurt as much as CCS. For you only bag and as someone unsure about their future paddling I would not recommend a barrel. I wouldn't be looking at high end "portage packs" either. Consider the Slogg line, maybe the 70L or 115L, a soft sided pack of 70 litres will hold a lot more gear than a 60L barrel and after you add a harness to the barrel would also be cheaper. Another brand to look at is SealLine (the 65 or 115L Boundary Packs). These types of bag when sealed up correctly are "almost" fully waterproof, they may have some leakage if they float around in very turbulent water for an extended period but for rain and casual dunking they are just fine. Most of us who have years of experience started with simple packs, even standard alpine style packs with heavy duty garbage bag liners will work. I also don't know what you mean by this. Syl, on the MEC website click on the section header Water. The drop down menu will show portage packs, dry bags etc. Lots there to choose from. Sometimes you might find portage packs 2nd hand in the Gear Swap section or on Kijiji. Also, if you're renting canoes this summer maybe you'll be willing to rent packs/barrels from the same outfitter? If you're going 4-5 days you won't need much. Then again if you're undecided you'll even like canoeing maybe borrowing pack, barrel, gear might be an option? And finally your chosen food may well determine which kind of pack or barrel you prefer to carry it in. The only time I've experienced anything like this is with a solo canoe when portaging. Solo canoes have installed seats that necessarily sit right behind your head when you're walking with the canoe down a portage. Because the seat is down near to your neck line when portaging, barrels can be a problem if you can't get the harness to adjust low enough so that the barrel hangs on your back below the seat. When I'm solo and portaging, I always carry the barrel (with some other random things) on its own on the second trip. For the first trip I've been able to adjust my Sealline 115L pack to hang on my back below the seat with the canoe overhead. Last edited by Brad Thomas on April 15th, 2019, 5:46 pm, edited 1 time in total. Most people, especially with a rental canoe (probably a heavy tandem) will not be portaging a 60 - 80 pound boat and a barrel (or any larger pack) at the same time especially if that barrel contains all your gear and weighs 40+ pounds on it's own. If a portage is easy enough to do that it's likely very short and flat so the need to single carry just isn't there. Pls specify what canoe you are using if you can.. a tandem? Since you are unsure about whether or not you will like canoeing be advised that most of us started with hiking packs ( as we had them) lined with garbage bags.. If you are careful with campsite selection you will be fine. As someone new to canoeing it is highly unlikely that you'll be single carrying portages. Expect to have to double back and make a second trip. One big pack or barrel on one trip and the canoe and maybe a smaller pack on the second. If you decide you want to go the barrel route and you're in the GTA, send me a PM. I use both, 115 bag for clothes and sleeping stuff. Barrel for food and another barrel for my camera gear. All fit into my dedicated solo boat length wise. As you can tell I do not do a single carry on a portage. You will need the gear so that is not an issue and packing will be a learning curve and really dependant on the seasons you paddle. What do you envision doing on your trips? Do what you enjoy outdoors and then no matter how many carries or the weather you will enjoy tripping. We use a 10 or 20 L bucket with simple snap on lid in addition to the portage pack gear bag. Mouse proof and nice table/foot stool for the shelter in the rain. I did find the gamma seal took up an extra inch or clear of clearance at the top and wasn't a totally rain proof seal unless it was screwed on super tight. My traveling companion with tendonitis didn't like it. I think rule one of tripping with others is to honour their preferences for a good time Some hate carrying things with their hands, others don't mind. Outfitters rent light canoes including solos. And quite frankly if you want to single carry you can Syl, just pack light. You are only going for 4 days after all, you can leave all the extra junk at home. As far as food goes you can go the dehydrated/freeze dried route to further cut back on pack weight and volume, but it is advisable to pack food/kitchen kit separate from all other gear. Hence the separate food/kitchen pack-barrel-bag item. It needn't be large and heavy, just separate. In any case a single carry is entirely in the realm of possibilities for your first trip, my only question is why? Why bother? ( I know this wasn't in your OP Syl) I recommend focussing on critiquing your gear, canoe, skills etc to assess what works for you in your possible canoe tripping future. And don't be too hasty in letting mistakes in gear selection/skills put you off. Adjust, adapt, and try again. 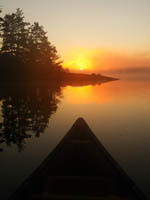 No-one ever found their own personal "sweet spot" in canoe camping their first time out. Finally, getting back to your OP, a 60L barrel isn't a bad idea IMO, just not the best and most comfortable one. They're less comfortable on your back and less comfortable sliding in and out of the canoe IMO. But I still like them. If I were to single carry ever again I'd go with an appropriately sized canoe pack. And as has been suggested it's not the end of the world to start with a backpack (maybe borrowed?). If you never go on another canoe trip a backpack will be more reusable in another recreational life, albeit way less cool than a portage pack. But that's just another one of my opinions. Same here. 115L portage pack for clothes, tent and etc soft stuff, barrel for food and cookware. My boats are outfitted to “trap” a barrel between a thwart and a couple minicel wedges contact cemented to the floor so the barrel can’t move. Two reasons barrel and pack; I have seen too many soft side packs chewed into by rodents going after food, and I don’t want food or cookware odors on my clothes, sleeping bag or tent. For food and cookware storage a 30L would be more suited size and (filled) weight wise. It is hard to resist filling the void in a half full 60L, but they get heavy fast. The only time we use our 60L barrel is on 4-person family trips, when one of my strong, healthy backed sons carries the damn thing. On long solo trips I use a 45L barrel, the one in the photo above. I have managed to fit twenty two days worth of food in that 45L barrel (with some freeze dry meals in a small dry bag at the start). On short trips I sometimes use two 10L Curtec wide neck drums, which fit nicely inside an old pack. I wish those wide neck drums were more widely available used; Durable, leak-tested waterproof, the wide neck is ideal for packing and the short squat 10 L’s can fit in a lot of in-canoe spaces where a 30L barrel won’t go. Mine are leftovers, originally shipped with laboratory salts.